Whilst it was a relief that, in 2010, the International Whaling Commission (IWC) did not legalise the large scale slaughter of whales, (something that the Obama administration was in support of!) they did however granted the Inuit of Greenland (the indigious population or aborigines of the area) permission to slaughter 9 humpback whales per year. These magnificent creatures winter in the Caribbean and pass by New England in the summer to return to Greenland, yet the USA were one of the countries voting for a killing quota to be allowed. 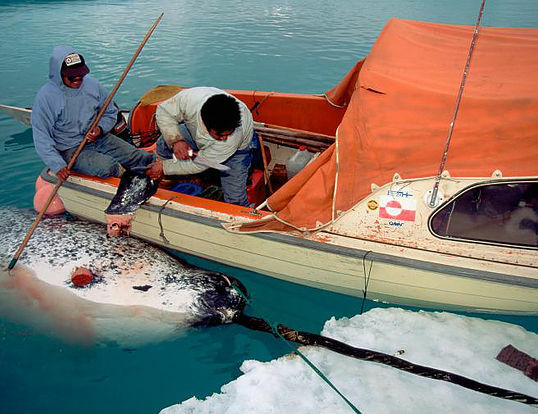 Whilst one might accept that the Inuit have to survive and their sources of food in such a climate are limited, the truth has been uncovered the number of whales killed far exceeds the agreed quota. Not only is this illegal but whale meat has been discovered being sold commercially in Greenland in supermarkets and being served as soup in cafes and sushi in elegant restaurants too. It is also known that Greenlanders are illegally hunting minke and fin whales. Greenlanders also slaughter and eat the rare and endangered Narwal, and also the highly socially evolved and intelligent Beluga whale, which is actually more a species of dolphin with a large and sophisticated brain. Not only is this damaging to the whale population and the ecosystem and foodchain in which it resides, but it is damaging to humans as this meat contains high quantities of heavy metals and organic pollutants which are dangerous for human consumption. The 2011 meeting of the IWC made some progress in the area of financial transparency to help avoid vote-buying tactics but did nothing to improve the Greenland position. 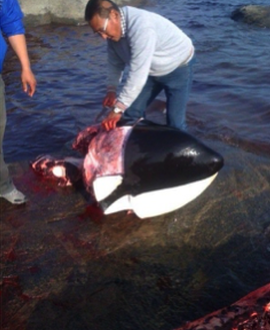 At the IWC in 2012, Greenland requested to increase the number of whales it wanted to kill but was unable to answer concerns raised by IWC members about increasing evidence of commercialization of the Greenlandic hunt. Many observers were particularly troubled by the sale of endangered species such as bowhead whales to tourists in restaurants. Greenland did not get the requested increase in quota that they were looking for and Denmark, their political representative, did not get a quota at all. The Danish civil servant that precipitated the failure of the vote, who infamously claimed that ‘Greenlanders could kill whales with baseball bats’ if they wanted, is now believed to be employed by the Greenlandic government as an advisor on whaling policy. In 2014 Greenland killed a total of 176 whales. This consisted of 157 minke whales, 12 fin whales and 7 humpbacks. The IWC has now decided to meet every two years instead of each year. Isn’t this surprising, when the population of whales is lower than ever before, and the problems greater than ever? And that some member states choose to flout the rules anyway. Make your voice heard – the more people who do this, the more likely we are to save these magnificent marine mammals.